Picture - A Mitsubishi Ki-46 "Dinah" in flight. The Mitsubishi Ki-46 was a twin-engine reconnaissance aircraft used by the Imperial Japanese Army in World War II. Its Army Shiki designation was Type 100 Command Reconnaissance Aircraft (一〇〇式司令部偵察機); the Allied nickname was "Dinah". On 12 December 1937, the Imperial Japanese Army Air Force issued a specification to Mitsubishi for a long-range strategic reconnaissance aircraft to replace the Mitsubishi Ki-15. The specification demanded an endurance of six hours and sufficient speed to evade interception by any fighter in existence or development, but otherwise did not constrain the design. The resulting design was a twin-engined, low-winged monoplane with a retractable tailwheel undercarriage. It had a small diameter oval fuselage which accommodated a crew of two, with pilot and observer situated in individual cockpits separated by a large fuel tank. Further fuel tanks were situated in the thin wings both inboard and outboard of the engines, giving a total fuel capacity of 1,490 L (328 imperial gallons). The engines, two Mitsubishi Ha-26, were housed in close fitting cowlings developed by the Aeronautical Research Institute of the Tokyo Imperial University to reduce drag and improve pilot view. 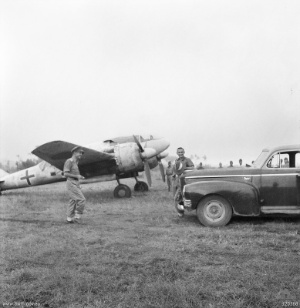 Picture - Mitsubishi Ki-46-III white painted with a green cross on the rear fuselage as a sign of surrender, captured by KNIL forces on October 3, 1945. Menado, Celebes. The first prototype aircraft, with the designation Ki-46, flew in November 1939 from the Mitsubishi factory at Kakamigahara, Gifu, north of Nagoya. Tests showed that the Ki-46 was underpowered, and slower than required, only reaching 540 km/h (336 mph) rather than the specified 600 km/h (373 mph). Otherwise, the aircraft tests were successful. As the type was still faster than the Army's latest fighter, the Nakajima Ki-43, as well as the Navy's new A6M2, an initial production batch was ordered as the Army Type 100 Command Reconnaissance Plane Model 1 (Ki-41-I). To solve the performance problems, Mitsubishi fitted Ha-102 engines, which were Ha-26s fitted with a two stage supercharger, while increasing fuel capacity and reducing empty weight to give the Ki-46-II, flying in March 1941. This met the speed requirements of the original specification, and was ordered into full-scale production, with deliveries starting in July. 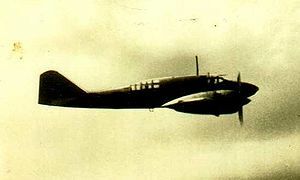 Although at first the Ki-46 proved almost immune from interception, the Imperial Japanese Army Air Force realised that improved Allied fighters such as the Supermarine Spitfire and P-38 Lightning could challenge this superiority, and in July 1942, it instructed Mitsubishi to produce a further improved version, the Ki-46-III. This had more powerful, fuel-injected Mitsubishi Ha-112 engines, and a redesigned nose, with a fuel tank ahead of the pilot and a new canopy, smoothly faired from the extreme nose of the aircraft, eliminating the "step" of the earlier versions. The single defensive machine gun of the earlier aircraft was also omitted. The new version first flew in December 1942, demonstrating significantly higher speed (630 km/h (391 mph) at 6,000 m (19,700 ft). 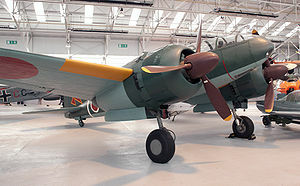 The performance of the Ki-46-III, proved superior to that of the aircraft intended to replace it (the Tachikawa Ki-70), which as a result did not enter production. Mitsubishi factories made a total of 1,742 examples of all versions (34 units Ki-46-I, 1093 units Ki-46-II, 613 units Ki-46-III, 4 units Ki-46-IV）during 1941-44. This aircraft was first used by the Japanese Army in Manchukuo and China, where seven units were equipped with it, and also at times by the Japanese Imperial Navy in certain reconnaissance missions over the northern coasts of Australia and New Guinea. The Japanese Army used this aircraft for the same type of missions (which were not authorized) over present-day Malaysia during the months before the Pacific War. Later, it was used over Burma, Indochina and Thailand, and in operations over the Indian Ocean. In 1944-45, during the last days of the war, it was modified as a high-altitude interceptor, with two 20 mm cannons in the nose and one 37 mm (1.46 in) cannon in an "upwards-and-forwards" position - almost like the Luftwaffe's Schrx�ge Musik night fighter cannon emplacements - for fighting USAAF B-29 Superfortresses over the metropolitan Japanese islands. It lacked stability for sustained shooting of the 37 mm (1.46 in) weapon, had only a thin layer of armour plating, lacked self-sealing fuel tanks, and was slow to climb. The Ki-46 was also assigned to two whole Sentai (wings/groups), as well as individual Chutaicho (junior operational commanders) in the Imperial Japanese Army Air Service, during the Pacific War. The Allies captured some examples during the conflict for evaluations. Picture - Mitsubishi Ki-46-III (Army Type 100 Command Reconnaissance Plane) at RAF Cosford. The only known survivor is a Ki-46-III Army Type 100 example, currently on display at Royal Air Force Museum Cosford. Picture - Another picture from the Mitsubishi Ki-46 at RAF Cosford. Reconnaissance version of the Ki-46. The first operational model of the series. Three-seat training version of the Ki-46. Used for radio and navigation training, with a redesigned cabin, dorsal echeloned extension. Conversions of the Ki-46 II. Defense interceptor/night fighter version of the Ki-46. Equipped with two 20 mm cannons in the nose and one 37 mm (1.46 in) cannon in the "Schrx¤ge Musik"-style dorsal frontal position. Land strike version of the Ki-46, without 37 mm (1.46 in) cannon armament. Prototype, equipped with two turbocharged 1,119 kW (1,500 hp) Mitsubishi Ha-112-II RU engines, and more gasoline store capacity. Chinese Communist Air Force Two captured Ki-46s in communist Chinese hands served as a ground-attack aircraft and a trainer respectively, and the last Ki-46 retired in early 1950s. Francillon, Ph.D., R�ne J. Japanese Aircraft of the Pacific War. London: Putnam & Company Ltd., 1970. ISBN 0-370-00033-1. 2nd edition 1979. ISBN 0-370-30251-6. Green, William. Warplanes of the Second World War, Volume Three: Fighters. London: Macdonald & Co. (Publishers) Ltd., 1961. ISBN 0-356-01447-9. "Mitsubishi Ki. 46...the Aesthetic Asiatic". Air International, November 1980, Vol 19, No 6. Bromley, UK: Fine Scroll. ISSN 0306-5634. pp. 227-233.